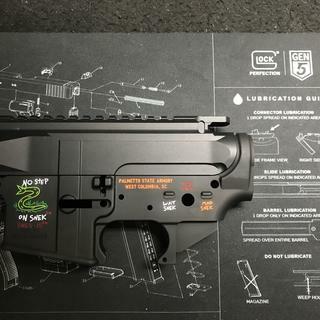 Palmetto State Armory’s limited-edition "SNEK-15™" lower will only be available once. 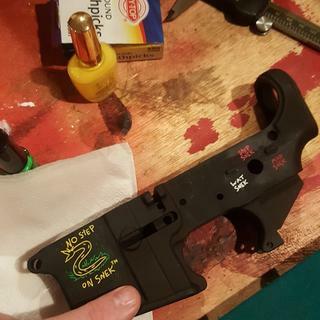 The "No Step On Snek” lower comes from the most advanced aerospace manufacturing technology and is one of the industry’s finest forged, MIL-SPEC lowers. 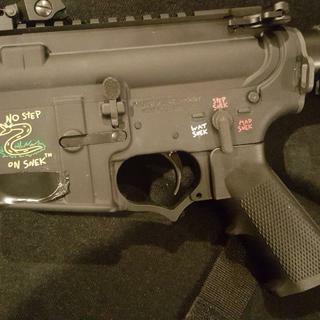 The PSA “No Step On Snek” lower is made using our automated manufacturing process. Our multi-million dollar engineering and manufacturing facilities allow us to produce a product of unequaled quality and value. These forged lowers are quality made, MIL-SPEC designed and use 7075-T6 Aluminum. 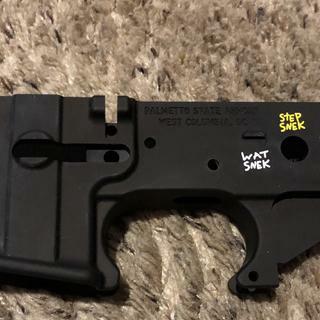 The Palmetto State Armory "SNEK-15™" Lower will accommodate all AR-15 platform builds and is marked "SNEK-15™ MULTI”. The finish is MIL-A-8625, Type III, Class 2 black. Serial numbers have the prefix of "NSOSXXXXX". Please please for the love of Snek make more of these. I and my 50 friends would like to haz snek, Please? BEST ANSWER: Your wish was granted for you and your 50 friends. Are available right now. This better not be the only Snek run'? I have whole build in my head that revolves around needing this Snek lower reciever. BEST ANSWER: Go ahead and get it now so you can complete your Snek build. Who knows how long they will last. What don’t people understand about “will only be available once”? BEST ANSWER: So the reason people are confused about the "will only be available once" , is because they keep getting emails from psa, promoting this lower, smart guy. So take a deep breath, do a little more reading and a little less typing next time. Apparently, "will only be available once" is part of the Common Core math as these were available again 12/7/2018 after selling out on 11/27/2018. So, much for "limited". The available once has been proven to be untrue and I can't say I blame Palmetto State for it. 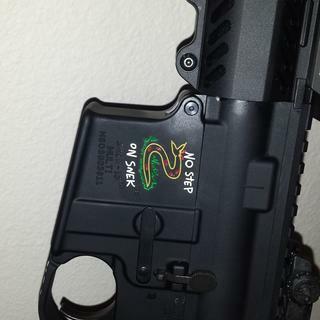 Available AGAIN on 2-1-2019..... no step on snek !! love it! Please don’t. They snooze they loose. Please make another run - My step kid (of legal age) wants to get one of these as well. Will there be a snek t- shirt it is the funniest.... I can't stop laughing ….LOVE IT ? BEST ANSWER: It's already a meme. Google "no step on snek shirt" and you'll have many options to choose from. I have the flag hanging in my barn. Will more of these be made? When might you expect more to be available? BEST ANSWER: Get them while they're hot. They are available right now. If these were truly limited and available only once, then how come they are available again when they sold out nine days ago? Inquiring minds want to know. BEST ANSWER: Because we live in a Capitalist country and thank the good Lord we do. 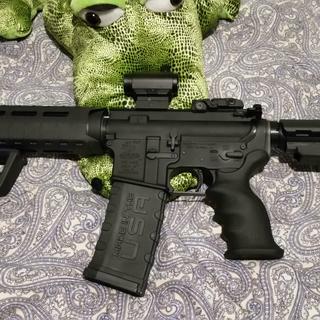 "Palmetto State Armory’s limited-edition "SNEK-15™" lower will only be available once". I believe this a pretty clear statement, unless the word "once" has changed its meaning recently. So, by your statement, Capitalism gives people the right to deceive? If PSA was going to release these multiple times then that should have been stated in the ad, which it clearly didn't. No more AR stuff form PSA for me. They are released in batches as they are produced until the production run ends. Of course they are. The question is about your claim of "limited issue" and availability of "one time only". Are there a finite number produced BEFORE selling them? OR are you continuing you r "production run" until sales go below a certain point? You seem to be saying they are not limited, unless by the number Palmetto can sell. I, and many others here, are simply asking for clarification. Are these produced in quantities that have no predetermined number set? NOOOOOO, make more PLEASE! He had more than 50 friends!!? 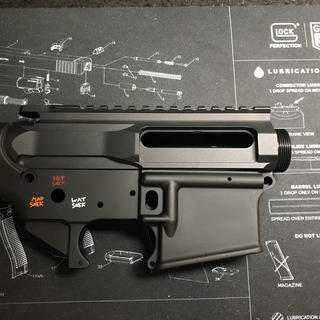 Is anyone else tired of seeing these limited lowers available over and over? The fact that this "available once" lower is available yet again has definitely turned me off from PSA. I have unsubscribed from the emails. BEST ANSWER: You could have just unsubscribed instead of complaining about nothing. And, you could have moved on without leaving a smart aleck answer. I am not the only one that is disappointed with the way PSA did this "Limited Edition". Now, if I could only unsubscribe from these notifications. Yes, it's not very honest for a company to tout something as a limited release- indicating it's a special run, and then just continuing to make more and more. The only people disliking it being called-out, are the ones who should have missed the opportunity to snag one, OR guys who just need to defend Palmetto out of some loyalty. Based on the comments here, Palmetto has claimed to have produced more of them to meet demand. I'm glad I got a Space Force- as that one and the "Pew Pew" rollmarks seem to be the only ones that were actually limited, and not just by the number Palmetto could sell. I get your point on this lower and it being "limited" , but in all reality it is rather limited when compared to the availability of all other stripped lowers that are available.. Really the only way to get a "truly" limited item is to have one designed and made to your specifications and make it truly unique in that way... I personally think that PSA has done a good thing with selling this lower in "limited quantities" compared to other lowers that they sell... It is just good for business for them. Supply and demand and all that it implies.. besides the price does not reflect a "limited: version of this lower.. Just my opinion. The description says one of the safety settings is Full Auto. Don’t you need a Class 3 permit to have a fully automatic weapon? Is this really full auto? BEST ANSWER: Full auto capability is determined by your fire control group. So, no it is not. Binary triggers also use the 3rd position markings. Cool! now re-do SPACE FORCE!? Will there be a no step on snek flag ….I will buy that.... Please don't change the picture of snek ...he is perfect..? BEST ANSWER: Just google "no step on snek flagno step on snek flag" and you will have tons of options to purchase a no step on snek flag of your choosing. Are any more of these coming? BEST ANSWER: Yes, this is like a Jeep Cherokee Limited; it is only 'limited' to encourage more sales. Charging sales tax has cured me from purchasing future Palmetto items. Can we please have another space force lower? Everytime I see this pop up again, I think, I wish they'd do this with the space force lower. 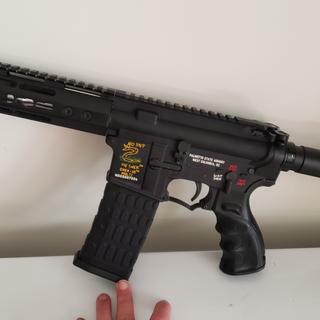 funny how the first sentence is "Palmetto State Armory’s limited-edition "SNEK-15™" lower will only be available once"
will you please not follow that same philosophy with SPACE FORCE now? Is this ever coming back in stock? Thought this was a 'limited run' a week or two ago when I rushed to buy one of these??? Did you guys seriously do another run of them... Will be the last 'limited edition' or anything I rush to purchase from PSA. BEST ANSWER: No more "Limited" stuff for me either. There was a planned total of 2400 made. When they hit 2400 they are gone for good. They come out as batches. Ordered 29th and shipped on the 2nd. Just to let people know? Will these be offered in 2019? BEST ANSWER: These will be available far into the future. The "Limited Edition" moniker is just there to peak your interest and make you think you need to hurry and buy the lower before they run out. sounds like an old carnie trick! These are available now for their shot show sale. How many of these were made, and how many are you currently planning to keep manufacturing with this specific (Snek) design? BEST ANSWER: Thousands were made. More will be made. Stacking the cash. How long will it take to get? BEST ANSWER: I ordered mine December 20, 2018 and they still have not shipped. So I would say quite a while if you ordered when they were last available. When will these be back in stock ?? Y U no has Snek now? Need snek pls!! I has snek. No step pls. U has snek? I has many pytons, on ground - balls, diamonds, in trees - jungles - here. Need snek lower, upper too. Is this a low or high shelf lower? These are high quality mil-spec lowers,I built a Space Force lower matched with an 8.5 PSA upper and it functions flawlessly. Please tell me that more Snek is on the way? Does it come with the patch ? When will more of these be available? We must have more SNEK lowers are more on the way??? 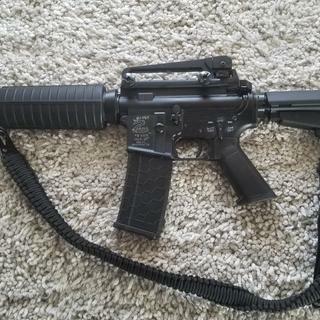 - I have a 4" muzzle brake with fangs that needs a new lower to call home. Does it have forward assist? BEST ANSWER: Apparently you are having vision problems. This is a lower. Not a lower with Wonder Woman's invisible upper. It has automatic forward assist, which is why you don't see the little button. But you need a tax stamp, because it is not semi-automatic forward assist. No, this is a lower receiver. Forward assist is on the upper. 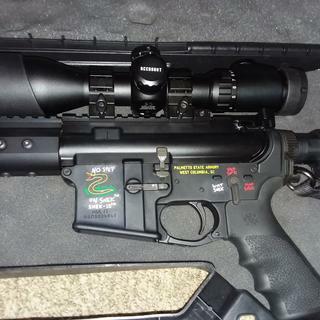 Can this be used for and AR-10 build? Are these low shelf lower receivers? 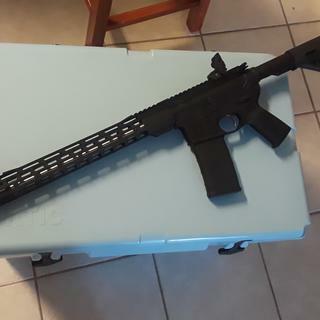 My first AR build. It was shipped fast. I used model paint and a needle thinking I could fill in the lines. NOPE, not even close. So then after a few passes with a Qtip and #9 solvent it turned out better than I hoped. Thanks. This lower is perfect. Everything went together without a problem. Used it for a 224 valkyrie build and love it. Can not beat the price especially during the promotion sale. Brilliant product, clean, well made and way too funny! Please make more, lots and lots more, I have 3 builds I need to get started on. Even finish, fun meme's, what's not to like. I didn't run into some of the other reviewers gripes. Everything functions as it should. 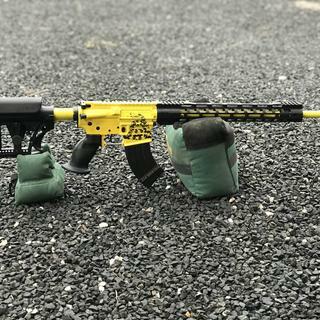 I used PSA's Mapul lower parts kit and it functions and looks great. Highly recommend this budget lower. I'm loving this lower. Soon as I got this pistol built 3 folks was trying to buy it off of me for the NSOS. Quality and affordability for those on a low budget! The anodizing job on this lower is really bad and now I will have to refinish it. Operationally, I think it's fine. 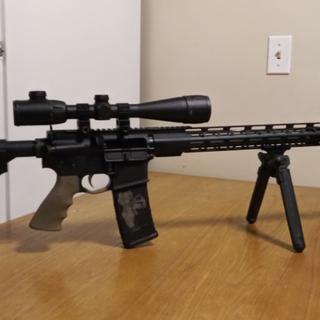 My 4.5y/o daughter has been wanting a new gun, something she can deer hunt with at close range, so I opted to do a budget AR build. I've got seekins, bcm's, DD, Adams, Aero and other top tier brands, but the PSA snek lower works just as good as a 250$ lower. The machine work is good, the snek looks nice,(her nickname is snake, so she wanted this one). 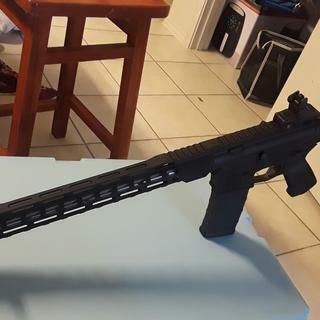 We were going to get a aero upper or a flat top upper from psa, but I didnt see anything that impressed me that would keep the build 'budget friendly'. for a rifle that will likely be severely abused. 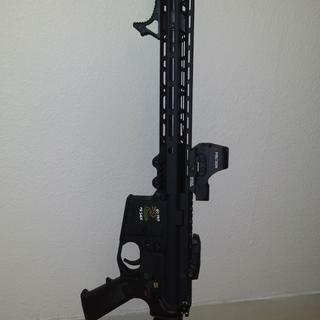 I ordered a BCA 300blk wolf fluted upper and it looks fantastic, and it works great. with a price point nearly half what others charge... EVERYTHING on the BCA upper is perfect... I was shocked and expecting junk. 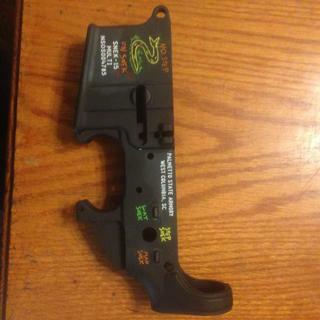 I'm still waiting on my LPK and Stock to finish processing.... so until then i've had to use other lowers, but with a little testors paint, and some patience this lower will look fantastic and hopefully be part of my kids 1st deer this fall. Very well finished and it is a “fun” build for my son. This forged receiver works flawlessly with my PSA upper. The reason for the 4 star is that I had to chase the threads in the grip handle bolt hole with a tap because the screw kept getting jammed when I tried to install it. Even after applying lubricant to the threads of the bolt! The snek is perfect for this type of weapon! The fit was good, however the finish is uneven. No problems with the holes, they all mic'd within mil-spec tolerances, but the thread for the buffer tube felt really rough and had a little more free play than I'm used to. It smoothed out after I ran the tube through a couple of times. I'm not expecting tier 1 quality for the price; the intended build is utilitarian, not show. For the price I'll deal with the complaints. and I like the novelty lowers. First time ordering from PSA after reading many reviews on the quality of their products, though I had also heard that shipping was a slow process. So I was surprised when my lower shipped the same day I had ordered it and arrived at my ffl 2 days later! I only just picked it up the other day and haven't had much time to play with it. From watching sales and new products, I also expected this one to sell out when it first came out, which it did, but then it showed up in a weekly sale so I jumped on it at a much better price! But then I saw it on the weekly special for the next 3 weeks I think lol. I can't wait to put this one together and hopefully many more in the future. Fit and finish are great. Assembled with a PSA pistol kit - flawless. Great job PSA! I have yet to assemble the lower so I can't comment on the functionality of this lower. Everything appears to be well machined and while there is nothing special about the finish, it does appear as expected. My only disappointment is that the Snek logo is only on the left (s/n) side of the mag-well and the right is blank. I wish this had been more evident from the website pictures. I would have probably ordered it anyway, but I really expected it would be on both sides. Looks great, happy with this lower. Good fit and finish good quality not a bargain, no Le/military discount ? Great buy I will definitely be looking for another. Looking forward to doing my build with this. Good lower, rather inconsistent, good price. Got this yesterday, it was covered in a ton of lube/gunk and was marred from factory on the right side. Not too big a deal for the price though. I need to give it a good cleaning and clp it before assembling it. The finish looks completely different than the one my friend received on the original run. Really like the how PSA can run with a good humor meme like this. Rise Armament RA-140 drop in didn't fit! 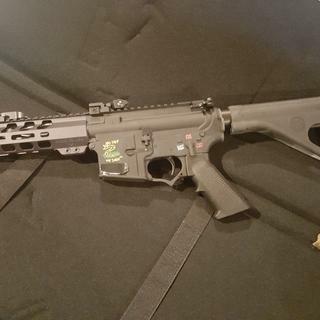 I bought this for a .224 Valkyrie build, thought the "SNEK" theme was funny. I purchased a Rise Armament RA-140 Super Sporting Trigger for it but could not get anti-walk pins through. Upon inspection the holes don't line up. Pretty disappointing. I'll just throw a mil-spec in there for now. I'm not sure if I just got a bad lower or what. The bolt catch that came with the Palmetto State Armory MAGPUL MOE LOWER BUILD KIT would not fit in this lower. I did have a regular PSA Lower (1728) on hand and the bolt catch fit perfect. I did contact PSA and they are sending a new bolt catch. I'm hoping this solves the issue. The finish on the Snek isn't near as nice as the regular PSA lower. Not a deal breaker as I'll be painting this this build anyway. I recommend sticking with the regular lower if you're looking for good fit and finish. great looking lower. works great with the binary trigger. wish it had logos on both sides of the mag well. I like the PSA lowers to go with my PSA rifle kit.Great value. 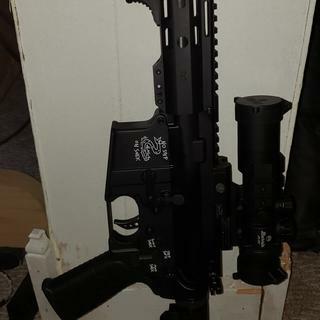 Recommend the lower,would buy another . But shipping was almost $10. Really missed the free shipping. It looks great, works well and fits my upper with no slop! 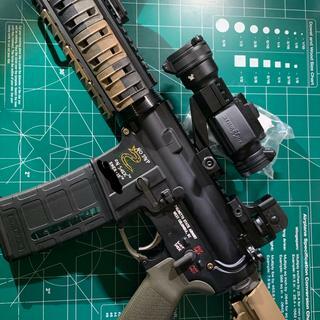 So getting the rubberized braced included with the kit, to go on over the pistol tube is a THING.... A PAINFUL THING... I used dry lube..on tube and in brace....push, twist, lean on, get help, even with all the love we could muster, it is still not flush with the receiver. Other than this one THING the rest is awesome. All other parts fit as advertised. Great lower! Went together perfect, no issues. the finish on this receiver is flawless. Great quality and happy to own it. Excellent customer service, prices, and fast delivery! 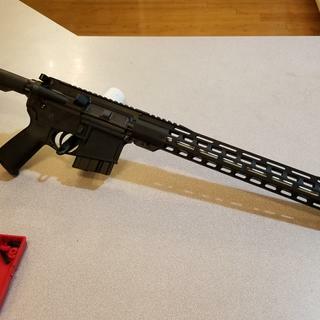 First ever AR build and it went great! Matched it with the PSA Magpul lower build kit and a PSA 18" 6.5 grendel upper. 10 rounds through it to test feed, fire, extract and everything functioned great! 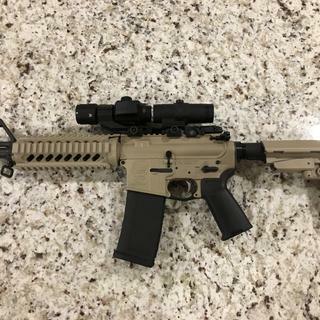 No sights or optics yet, but this is going to be a great gun! Will absolutely buy more from PSA! AMAZING QUALITY, AT 1/4 THE PRICE. This lower is great, I bought 2 and wish i bought more. The killing and surface finish is great. 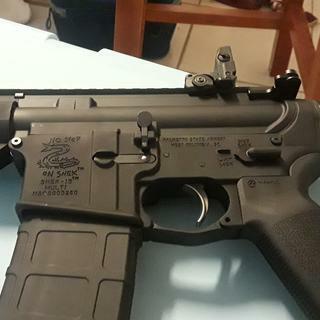 I actually like this lower over my Adam's arms lowers that I have on my other ar's. Great quality at the great price I have come to expect from palmetto state. PSA lowers are an amazing value for their price especially with the quirky/ funny engravings. 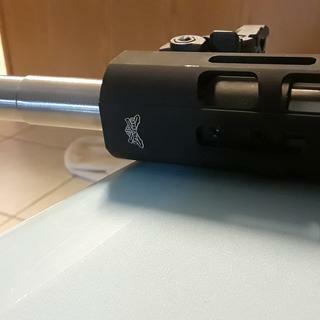 You’d be paying three times the price or more for lowers from other manufactures with engravings for about the same build quality, don’t be fooled PSA is the bee’s knees! Great product everything fits perfect great quality, fast shipping. Perfect addition to my collection. As always a high quality mil-spec lower from PSA. Fit and finish as in all my palmetto is superb. Snek lower is super quality and looks great!!!! I love this lower. I saw it and had to have it. I'm a little bummed about how they were supposed to be a limited run, yet they seem to come up for sale in the email ads every other week. Not so limited after all I guess. My only regret is not buying the SNEK-15 Lower sooner! 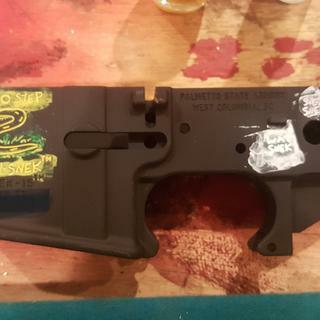 Quality lower at any rate, but with $10 in paint markers, you will be the envy of your friends. Personally I still laugh, every time I see it. Nice lower. Shipping is way overpriced though at $9 per lower. Fast shipping and this item is just perfect. Can't wait to build my next AR. Will add photos when finished. Other than being a bit dry/chalky feeling it's a good lower. 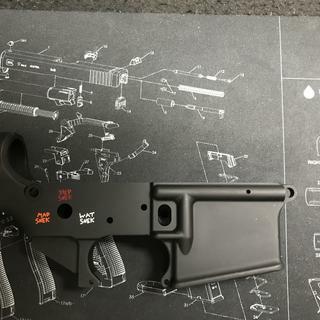 Assembled into a completed lower with no real effort. Some small blemishes on the outside but nothing too deep. Once it's got some oil on it the chalky feeling is reduced a bit. This was a really nice addition to the rifle. I really like the snek receiver. 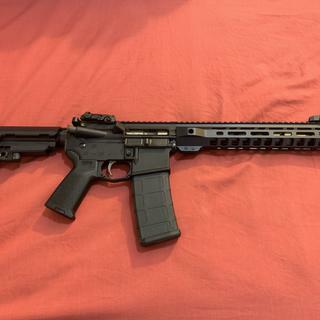 I used it to complete a M-lok build and it seemed to add character. 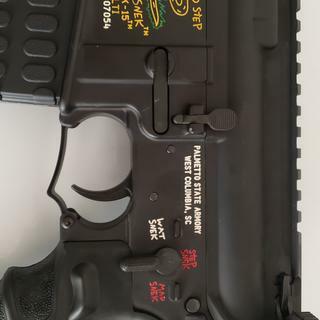 It’s a mil spec receiver with a fun message on it.